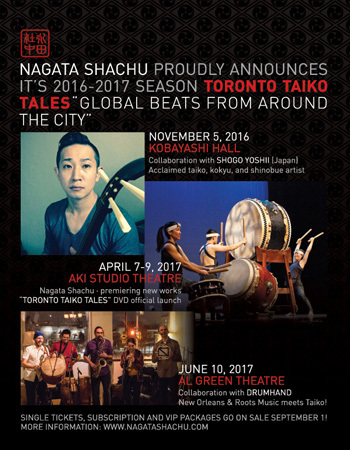 Cultures and genres clash as the rhythms of taiko, New Orleans parade bands and roots music come together in a unique collaboration between Nagata Shachu and the acclaimed ensemble DRUMHAND. Increasingly known for their innovative performances, DRUMHAND introduces listeners to inventive orchestrations and previously unexplored blends of sound and texture. Hands, sticks and mallets pound out old and new rhythms on weathered skins. Add traditional Japanese drums and instruments to the mix and a rare and exciting performance is sure to result!